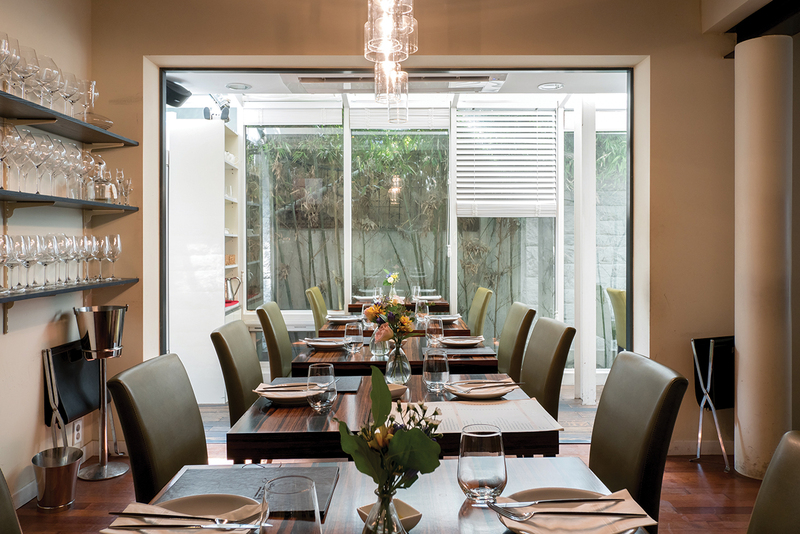 The brainchild of Chef Jun Lee’s Michelin-starred Soigné, Doughroom is proud of its hand-crafted pasta made daily. Each pasta dough uses specific ingredients carefully chosen to match the flavors of the sauce and toppings. The dough is then hand-crafted into pasta shapes that enhance the individual dishes. It’s this attention to detail that distinguishes Doughroom pastas from others. Chef Lee says his stint at New York’s Lincoln Ristorante was the beginning of his love for pasta. When he returned to Seoul, Chef Lee organized Jun the Pasta pop-ups that introduced the French-American style of pasta he learned in New York. And these pop-ups led to the openings of Soigné and Doughroom. As you enter Doughroom’s main hall, it’s hard to miss the glass display with its bowls and bowls of fresh pasta. The open kitchen is also full of cooks making and shaping the dough. The squid ink capellini in a garlic butter sauce is a signature dish at Doughroom, but there are seasonal and special pastas as well. There’s a good selection of stuffed pasta dishes including their agnolotti filled with taleggio cheese, pistachios and chorizo in a spicy butter sauce. Another fan favorite is the gnocchi with black olives and truffle oil. A tasting menu is available by reservation and the wine list offers half-bottles and wine by the glass. Reservations are highly recommended. Ciuri Ciuri is the name of a popular Sicilian folk song, “Flowers Flowers.” It also happens to be the nickname of the chef, Filippa “Fiore” Fiorenza, who runs the restaurant with her sommelier husband Enrico Olivieri. 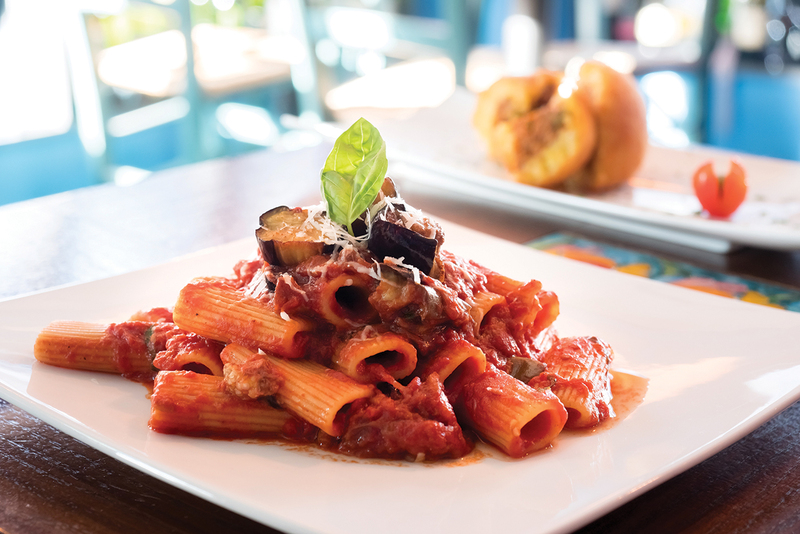 They are passionate about sharing their Sicilian cuisine with local diners and expats. 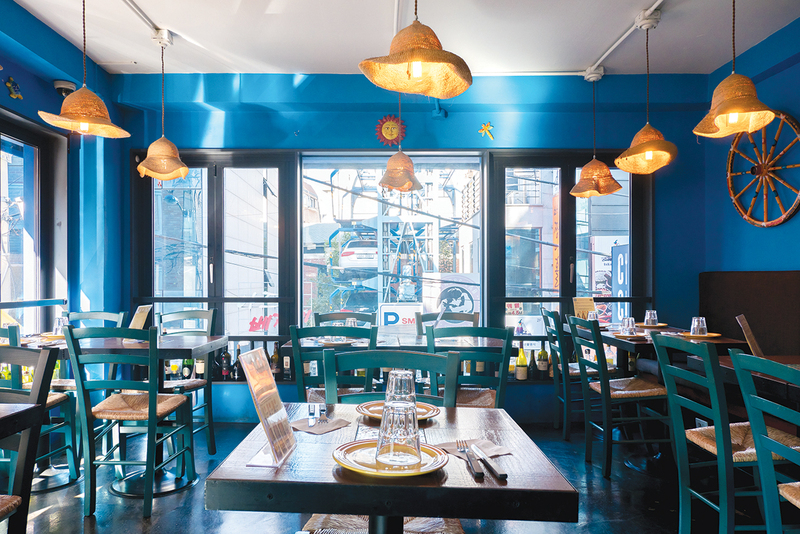 The cozy restaurant is painted in bright blue both inside and out and features a nautical theme. The walls are decorated with fishing nets, brightly colored tiles and ceramics from Sicily. The bold colors are represented in the menu with signature Sicilian dishes like the arancini. Ciuri Ciuri serves five different arancini dishes, all from the family recipe vault. These deep-fried saffron-seasoned risotto balls contain everything from classic ragu to spinach and bechamel sauces. A deep-pan Sicilian pizza filled with tomato sauce and cheese is another crowd-pleaser. Pasta con bottarga is classic Sicilian pasta with air-dried grey mullet roe slices. Whatever pasta you choose, don’t forget to finish your meal with that most famous pastry from Sicily, the cannoli. Gallina Daisy is named after Chef Daisy Park and the Italian word for hen. This mother hen chef earned her pasta chops by working ten years for famed local chef Santino Sortino. Chef Park continues to travel to Italy every year to learn regional cuisines and develop new dishes for Gallina Daisy. 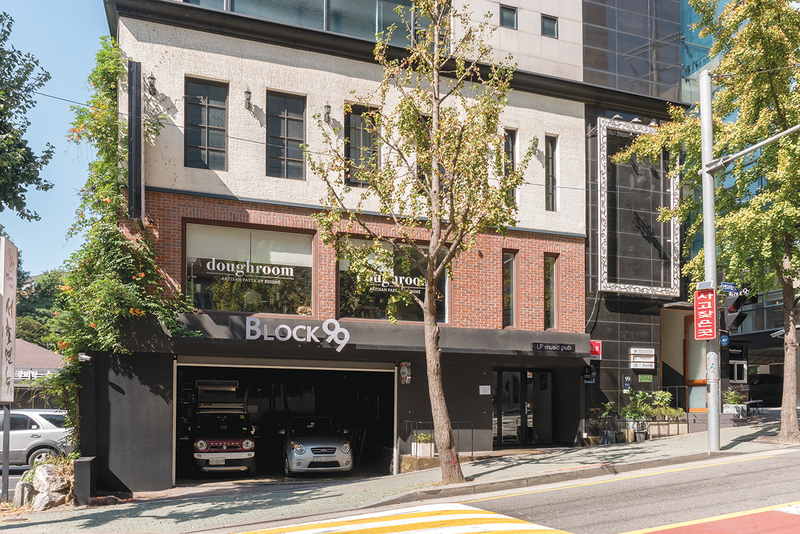 The restaurant is a converted 1950’s residence in the Hanok-filled neighborhood of Seochon. The main dining hall is located on the first floor, the second floor provides dining rooms open for cooking classes, and the third floor is a private dining space that offers an amazing view of Inwangsan mountain. 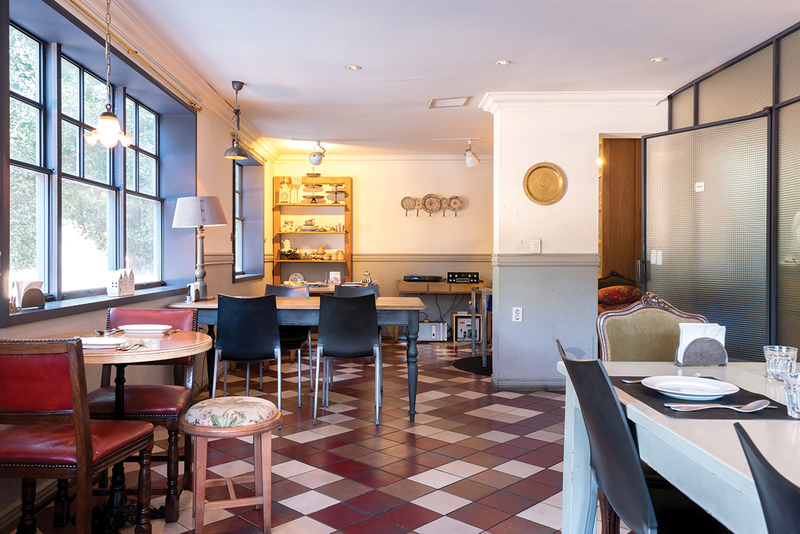 The softly-lighted dining hall and dark-wood furniture create a warm, inviting atmosphere accompanied by elegant dishes. 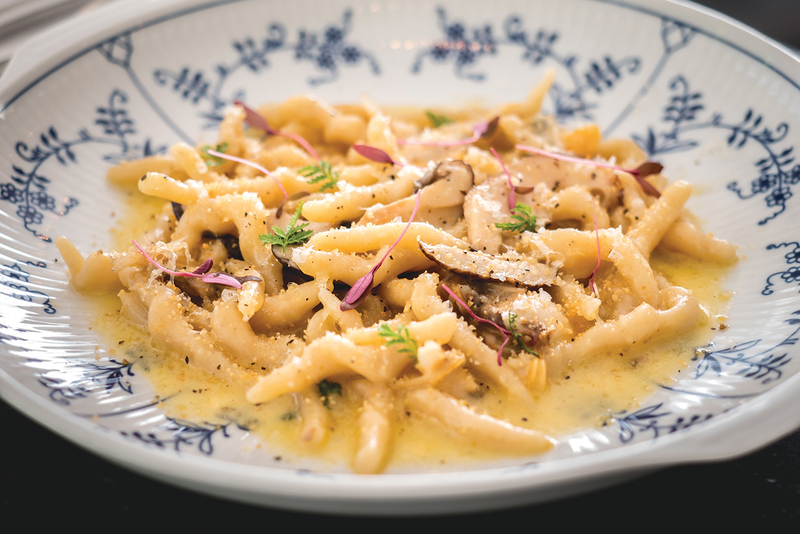 Gallina Daisy strives to serve seasonal Italian pastas using simple but flavorful local ingredients. Chef Park believes Italian food doesn’t require imported ingredients from Europe, and instead, incorporates Jeju black pork, local fish, pork from Jirisan and other ingredients from around the country. 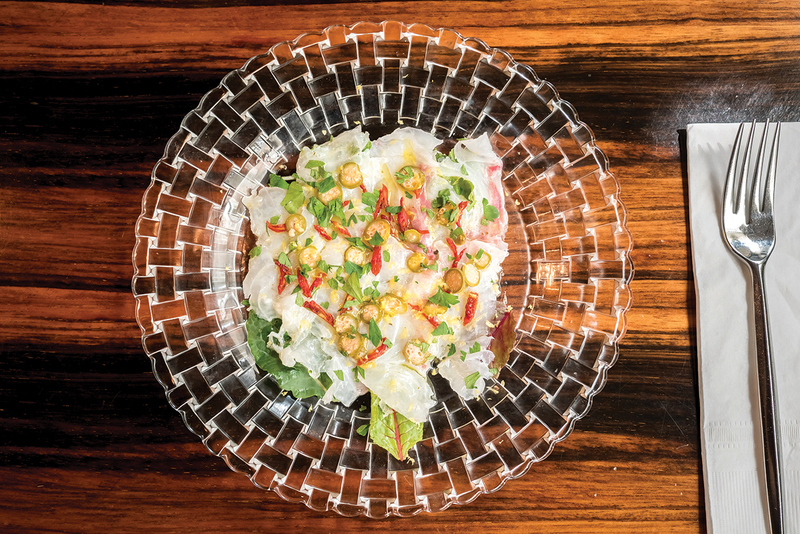 One great example is the fish carpaccio dish that’s both local and seasonal. Another signature dish is the spaghetti with bottarga, zucchini and Moresca olive oil. 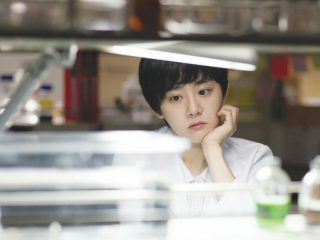 The bottarga, or mullet roe, is air-dried in Jirisan with moonbaeju. The flavors come solely from the fresh ingredients as the kitchen doesn’t use artificial seasoning. Everything is made on site, from the breads to the desserts. Café Dimi is a neighborhood stalwart. 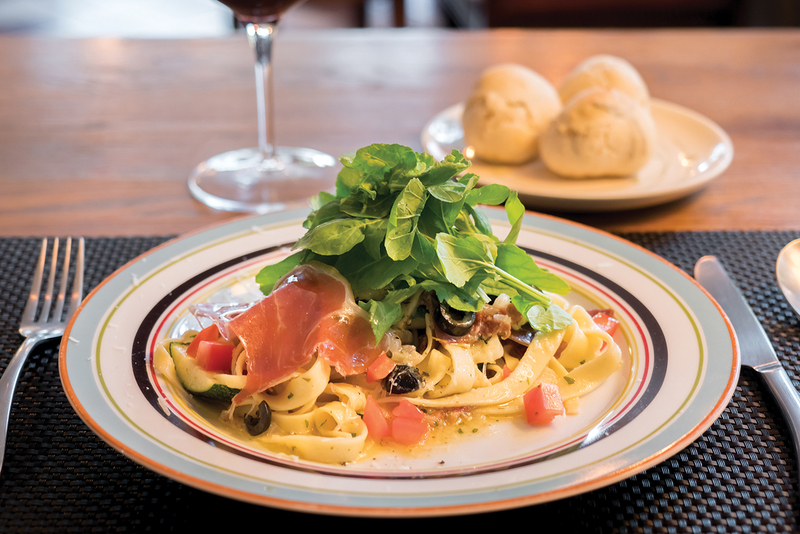 Numerous bistros and cafés have come and gone in the Seochon area, but Dimi has stayed its course, serving fresh pastas, pizzas and wine at surprisingly affordable prices for nearly a decade. It’s easy to pass by the corner-shop restaurant as there’s no blaring sign. Neighborhood regulars know that the food is great, but the café views of Gyeongbok-palace road are hard to top. 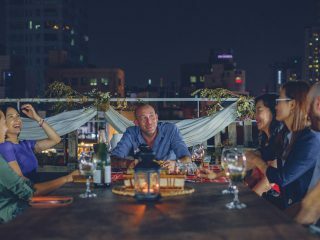 Grab a seat by the window at dusk and drink in the Seochon views as you dig into their pastas and pizzas. Each morning, the Dimi kitchen is busy at work making the doughs for their pastas, pizzas and breads. The restaurant focuses on quality ingredients that are local, seasonal and organic. They realize that while Seochon is a popular day-tripper neighborhood, the key to survival is to attract dangol or regular customers. Dimi does this with good quality sandwiches, pastas and pizzas around the KRW 10,000 price range. The lovely views come free of charge.